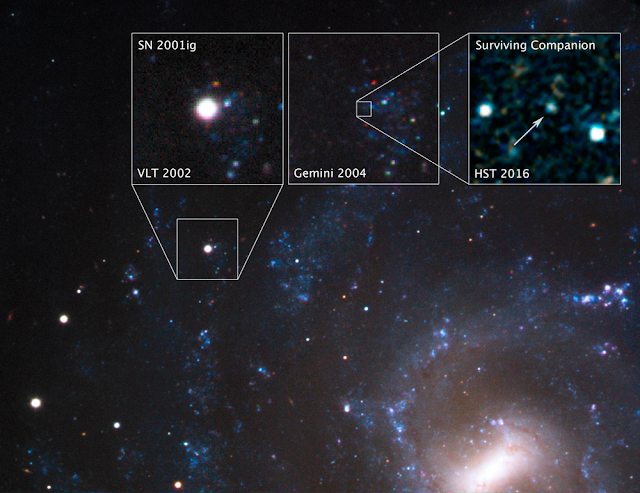 April 26, 2018: In the fading afterglow of a supernova explosion, astronomers using NASA’s Hubble Space Telescope have photographed the first image of a surviving companion to a supernova. This is the most compelling evidence that some supernovas originate in double-star systems. The companion to supernova 2001ig’s progenitor star was no innocent bystander to the explosion—it siphoned off almost all of the hydrogen from the doomed star’s stellar envelope. SN 2001ig is categorized as a Type IIb stripped-envelope supernova, which is a relatively rare type of supernova in which most, but not all, of the hydrogen is gone prior to the explosion. Perhaps as many as half of all stripped-envelope supernovas have companions—the other half lose their outer envelopes via stellar winds. Seventeen years ago, astronomers witnessed a supernova go off 40 million light-years away in the galaxy called NGC 7424, located in the southern constellation Grus, the Crane. Now, in the fading afterglow of that explosion, NASA's Hubble has captured the first image of a surviving companion to a supernova. This picture is the most compelling evidence that some supernovas originate in double-star systems.